Box Notes: This week’s box contents represent the best of springtime: spring onions, arugula, asparagus, and young carrots. 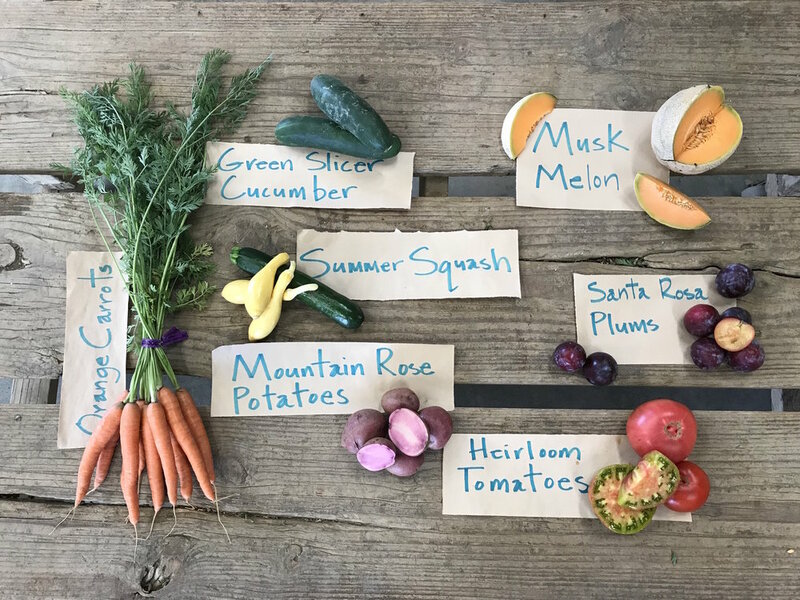 Each crop has their own distinctive flavor and in our northern CA growing climate, the season is brief for these delectable vegetables. All of our spring crops prefer cooler temperatures. While we harvest the spring’s splendor, we watch the summer crops grow and tend to them giving them the attention they need to thrive for the next 7 months. Field Notes: One of our favorite seed variety discoveries in recent years is the purple daikon. We grow it for spring, winter and fall harvest. It is a mild flavored radish with a purple hue. When we sample the purple daikon at market, it flies off the table, along with the carrots, black Spanish radish, and even the raw turnips. The April showers have continued to keep the soil moist and are hydrating the recent transplants reducing our need to irrigate. On the meat front, we are experimenting with some chicken sausage recipes at our processors Manas Custom Meats in Esparto and Roundman’s Smokehouse in Ft. Bragg. As soon as the recipes come together, we will be offering pastured chicken sausage via our web-store. ETA on the chicken sausage availability is mid-May to early June. The California Honey Festival in Woodland, Saturday May 5, 2018, 10 am to 5 pm: https://californiahoneyfestival.com/. Capay Valley Mothers Day Farm and Garden Tour May 13th, 10am to 5 pm. $10 per adult, children 12 and under are free. Visit the breathtaking gardens of the Capay Valley! Come join in the delight of spring flowers, strolling through many of the Valleys’ finest gardens. Talk to the gardeners themselves and learn the secrets of their success. New gardens have been added this year as well as several points of interest along the drive though the valley. Many of the gardens are also showcases for agricultural production in the Capay Valley. You are welcome to picnic in the gardens, box lunches will be for sale at the Guinda Grange Hall using local ingredients. Cases of Asparagus: 11 and 21 pound cases available. All asparagus $5/lb.